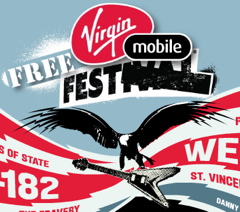 Yes, that’s right, the Virgin Mobile Festival is now a free ticket. The event will be a one-day gig, instead of two, and now has moved to Merriweather Post Pavilion, down from Pimlico in Baltimore. The headliners of this year’s fest, dated August 30th, are Weezer and Blink-182, with Franz Ferdinand, Jet, The National, The Bravery, Girl Talk, The Hold Steady, Taking Back Sunday and Wale warming them up. Why free? Virgin’s saying because the economy is down, we all deserve a free show. Hot damn. Thanks guys. Public tickets go up for grabs on Saturday morning, and they’re free except for Ticketbastard’s pesky service charges, unless you hit the box office at Merriweather or 9:30 club. If you’ve gone in the past, watch for an email this morning or tomorrow, for an early free-sale opportunity.